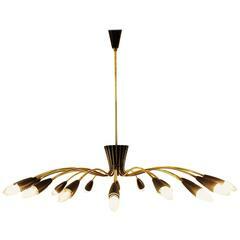 Elegant 1960s Italian chandelier in brass and black lacquer 18 lamps. Italian brass and glass long chandelier. Glass and opaline Italian suspension, a pair available sold 1800€ par piece. Two oversized 1960s chrome chandeliers. Italian chandelier Stilnovo opaline glass brass and teak. Beautiful and in excellent condition. Italian chandelier Stilnovo opaline glass brass. Beautiful and in excellent condition. Nice chandelier made of brass, opaline glass and glass shade.